Ananth Kumar Death: Ananth Kumar died at a private hospital in Bengaluru. He was being treated for lung cancer for several months. The Karnataka government Monday declared a three-day state mourning till November 14 as a mark of respect. 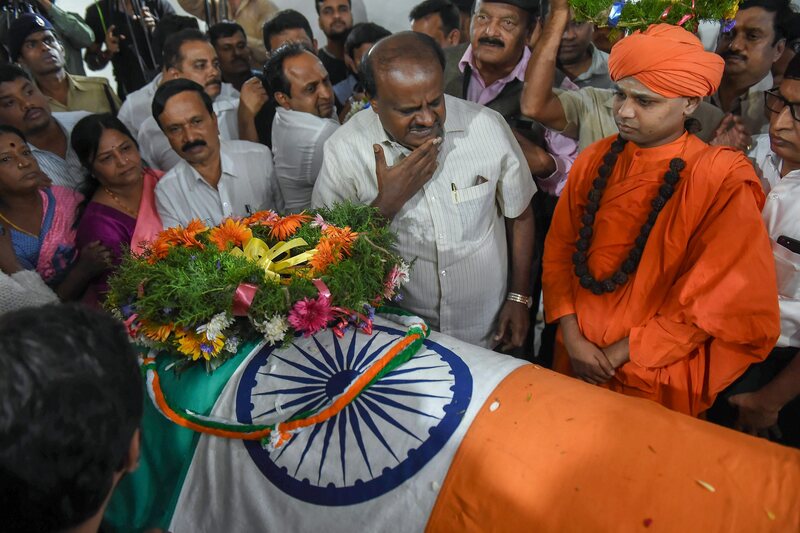 The state funeral of union minister Ananth Kumar, 59, who died at 2 am on Monday,took place today at Karnataka capital Bengaluru's Chamrajpet TR Mill crematorium. The mortal remains of Union Parliamentary Affairs Minister were consigned to flames with full state honours after hundreds of mourners paid their last respect to the departed soul. 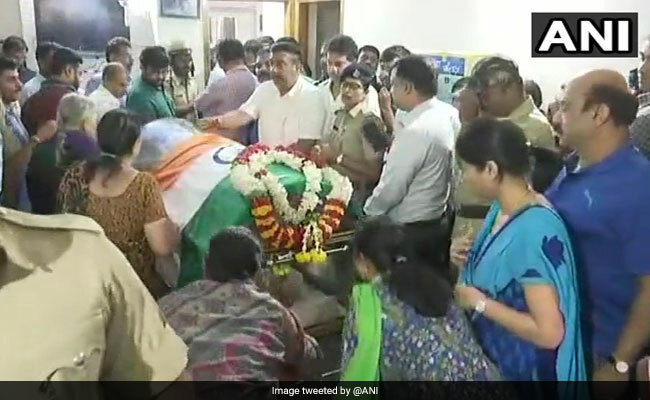 Before the last rites, the body of the union minister was brought to the Karnataka BJP office at 8 am. The body was kept there for the public to pay their last respects, till 10 am. 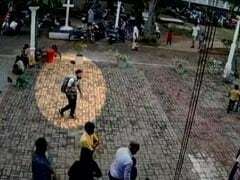 The body was then shifted to National College Grounds at 10 am. After news of his death, condolence messages from a vast spectrum of political leaders poured out. President Ram Nath Kovind, Prime Minister Narendra Modi, BJP chief Amit Shah, home minister Rajnath Singh, defence minister Nirmala Sitharaman, foreign minister Sushma Swaraj, Congress chief Rahul Gandhi and many other leaders expressed grief and shock over Ananth Kumar's death. Ananth Kumar died at a private hospital in Bengaluru. He was being treated for lung cancer for several months. 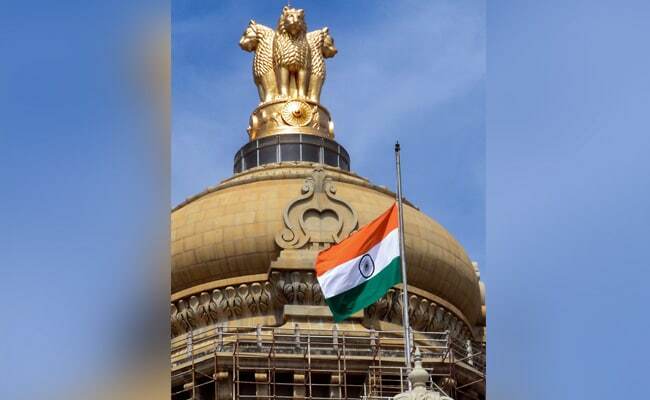 The Karnataka government on Monday declared a three-day state mourning till November 14 as a mark of respect. 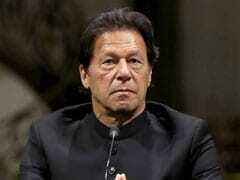 A government notification said there would be no official programmes held during the state mourning. The national flag would fly at half-mast on all government buildings. BJP chief Amit Shah, home minister Rajnath Singh, Vice President M Venkaiah Naidu, Nirmala Sitharaman, LK Advani and Lok Sabha speaker Sumitra Mahajan attended the funeral. The mortal remains of Union Parliamentary Affairs Minister and senior BJP leader Ananth Kumar were consigned to flames with full state honours. 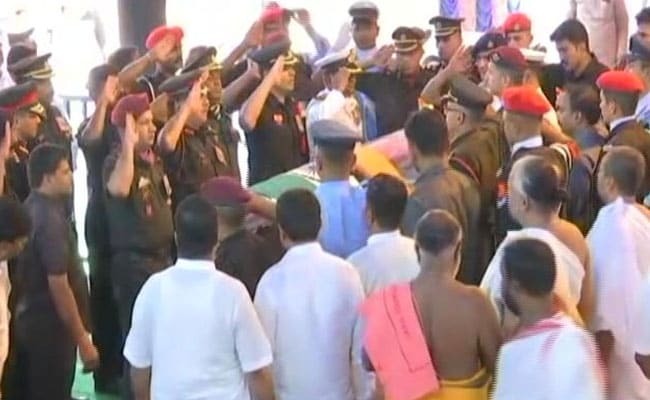 As the Army band sounded the bugle to mark the last rites, a 21-gun salute was given to Ananth Kumar draped in the Tricolour in the glass casket. Kumar's younger brother Nand Kumar lit the funeral pyre amid chanting of Vedic hymns and loud cries of "Ananth Kumar amar rahe!" 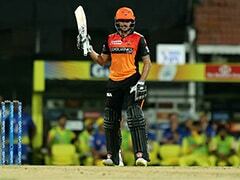 (long live Ananth Kumar). 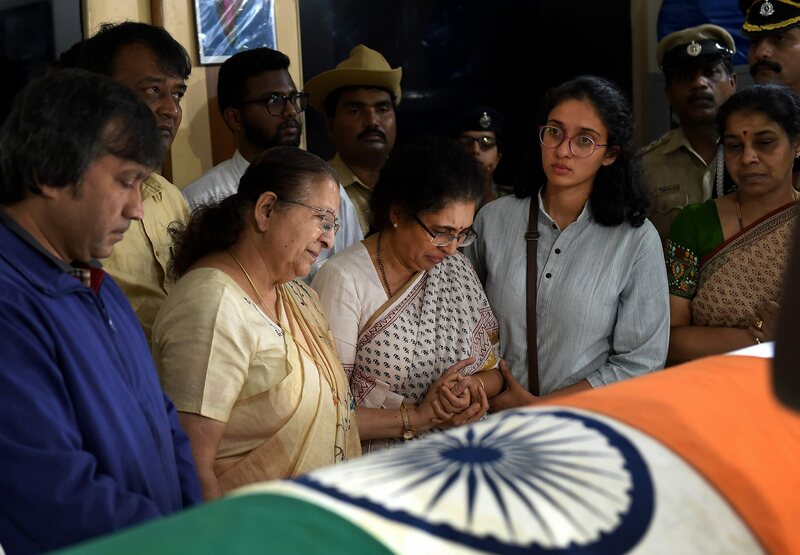 Kumar's widow Tejeshwani, daughters Aishwariya and Vijeta and other family members were present at the Chamarajpet crematorium in the city's southwest suburb. Union Minister and senior BJP leader Ananth Kumar, who died on Monday morning at a hospital in Bengaluru, was cremated this afternoon. Vice President M Venkaiah Naidu, BJP President Amit Shah, Home Minister Rajnath Singh and Lok Sabha Speaker Sumitra Mahajan and other political leaders attended the funeral. Union minister Ananth Kumar has been cremated with full state honours. 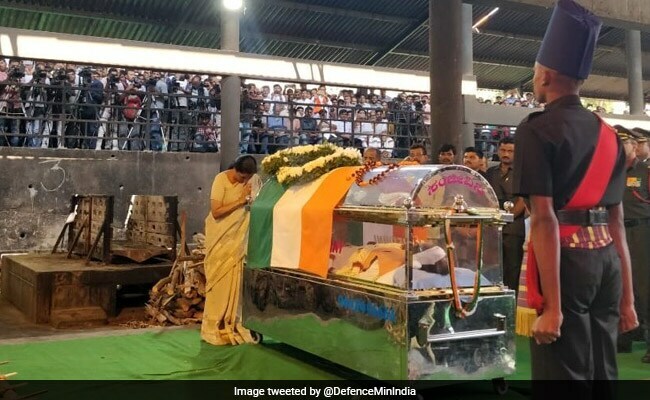 Thousands of people, including union and state ministers and the general public, paid homage to late Union Minister Ananth Kumar in Bengaluru on Tuesday, according to news agency IANS. 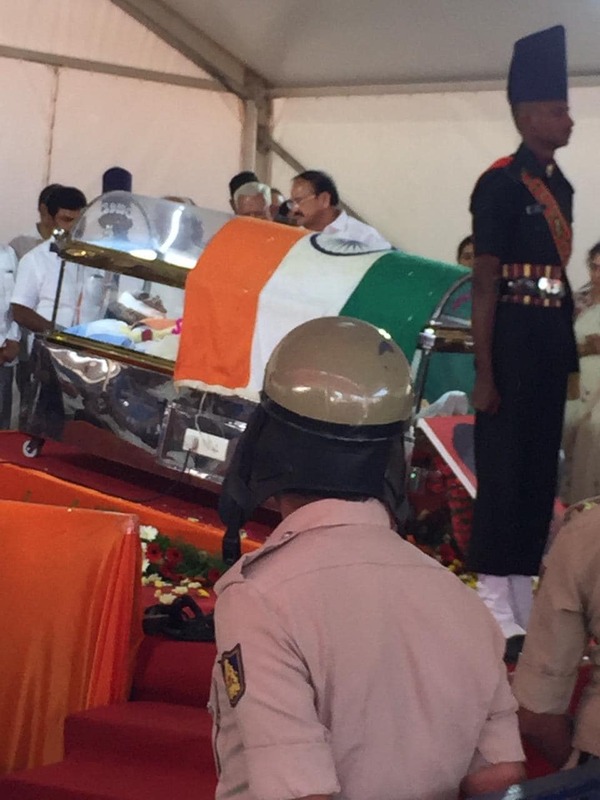 Anath Kumar's body was kept in a glass casket draped in the national flag for people to pay their last respects. Ananth Kumar accorded with state honours. Amit Shah pays his last respects. Rajnath Singh has paid his respects to union minister Ananth Kumar. 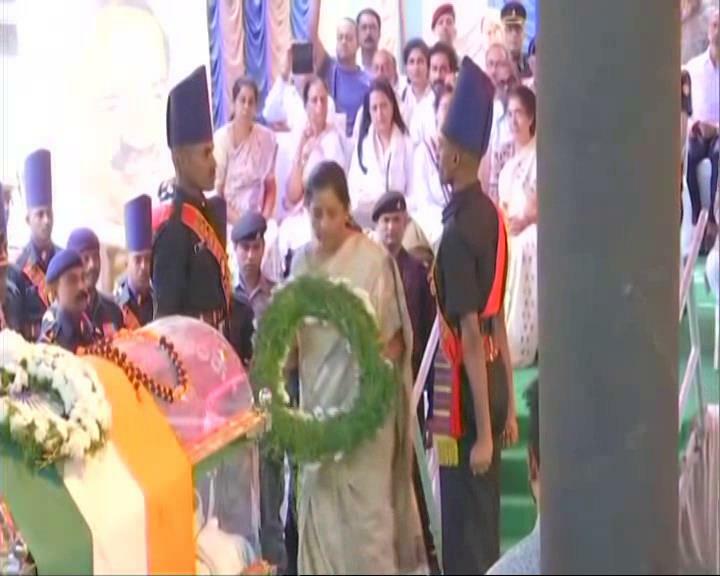 He laid a wreath on the union minister's casket. LK Advani, Nirmala Sitharaman and Ravi Shankar Prasad are also present for the funeral ceremony of union minister Ananth Kumar. 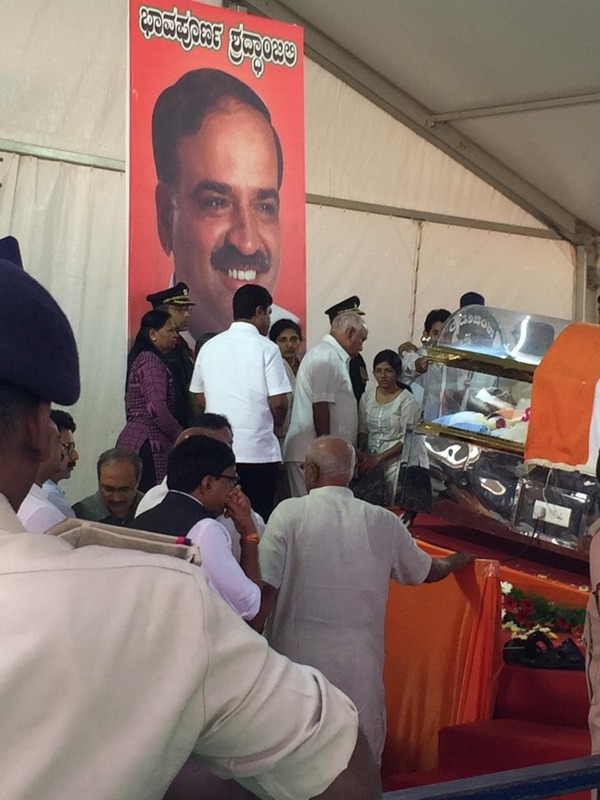 Union minister Ananth Kumar's last rites are being performed at the Chamrajpet crematorium in Bengaluru. The body of union minister Ananth Kumar has been taken to the cremation ground to perform final rites. Apart from Vice-President Venkaiah Naidu and BJP President Amit Shah, union ministers, including Rajnath Singh, Piyush Goyal, Harsh Vardhan, Radha Mohan Singh, Ramdas Atavale, Mahesh Sharma, Ashwinikumar Choube and Ramkripal Yadav would pay homage on Tuesday, party sources said, according to news agency Press Trust of India. 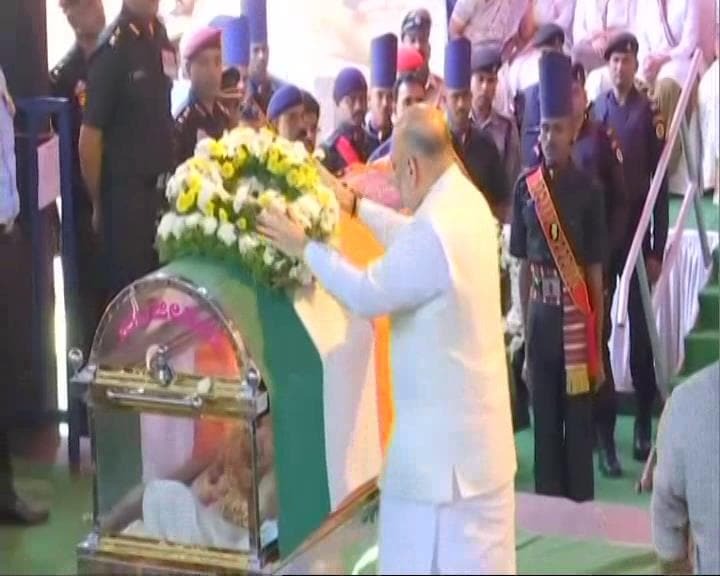 The body of union minister Ananth Kumar has been brought to Bengaluru's National College ground. 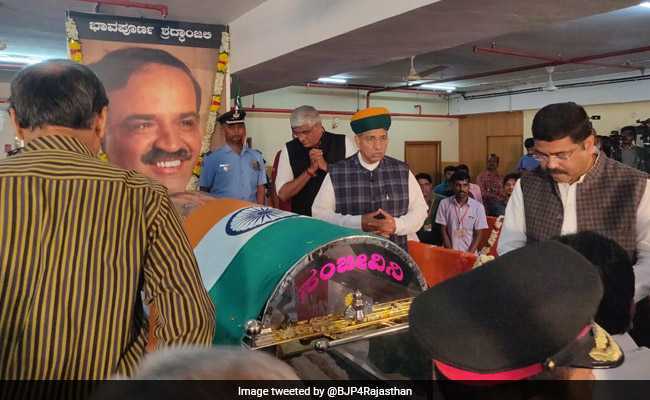 A stream of leaders and supporters Tuesday paid their last respects to union minister and senior BJP leader Ananth Kumar, who died on Monday. The body was taken from his Basavanagudi residence in Karnataka capital Bengaluru, where it was kept since Monday morning to Jagannath Bhavan, the BJP state headquarters at Malleshwarm, in a decorated military vehicle with personnel of the three services- the Army, Navy and Air Force- accompanying it, according to news agency Press Trust of India. The procession began, with supporters chanting slogans "Bharat Mata Ki Jai", "Ananth Kumar Amar Rahe", according to PTI. State BJP President BS Yeddyurappa and party's General Secretary in-charge of Karnataka Muralidhar Rao were present at the state BJP office. 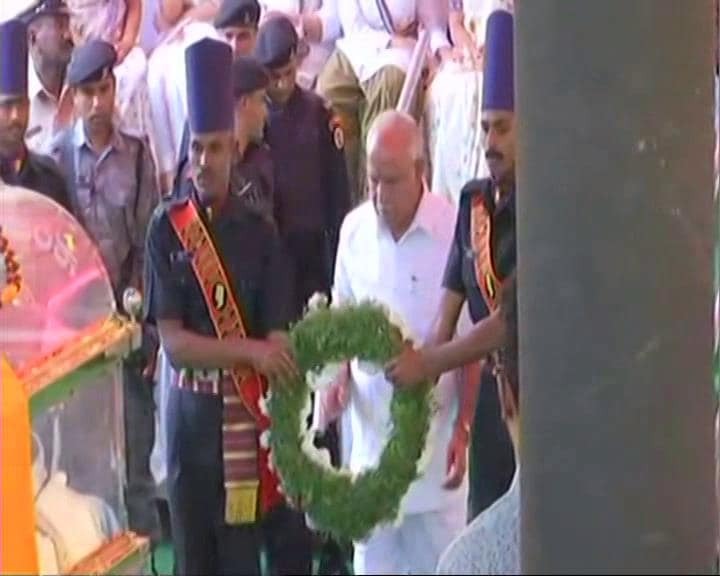 Several BJP leaders including Union Minister Sadananada Gowda, R Ashoka, KS Eshwarappa, Anurag Thakur, Prahlad Joshi and hundreds of party workers paid their last respects to the departed leader at the party office, where the body will be kept for about an hour. The cabinet meeting being held by PM Modi to pay tribute to Ananth Kumar is over. A two-minute silence was observed during the meet in honour of Ananth Kumar's memory. There are big traffic jams around Bengaluru's National College, where the body of union minister Ananth Kumar is being taken for public tributes. PM Modi is currently holding a cabinet meeting at his residence in Delhi.The meeting is to pay tribute to union minister Ananth Kumar. Yesterday, it was reported that PM Modi would chair a special meeting of the cabinet to condole the death of Ananth Kumar. 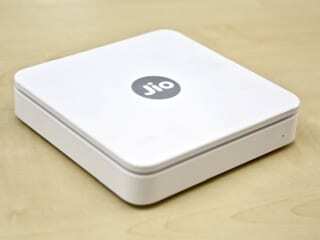 Rajnath Singh is also expected to attend the funeral of Ananth Kumar. Amit Shah is soon to leave for Bengaluru to attend the funeral. 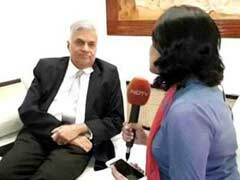 He was supposed to address rallies in Chhattisgarh today. Ananth Kumar's body will be taken to Jagannath Bhavan, the BJP's state office in Bengaluru's Malleshwaram and from there he will be taken to the National College grounds for public homage. He will be cremated around 1 pm at the Chamrajpet crematorium, state BJP General Secretary N Ravi Kumar said. Union Minister and senior BJP leader Ananth Kumar, who died on Monday morning at a hospital in Bengaluru, will be cremated this afternoon. Vice President M Venkaiah Naidu, BJP President Amit Shah, Home Minister Rajnath Singh and Lok Sabha Speaker Sumitra Mahajan are expected to attend the funeral.